Callaway bill the XR 16 fairway wood as providing the golfer with "all the confidence and the technology to hit it long and straight”, and say it is the brand’s highest MOI, COR and lowest CG fairway wood ever. Well, we weren’t going to take their word for it – we went to the range with a SkyTrak system to see if they were bluffing, or holding a winning hand. Boasting a bigger head that really instils confidence behind the ball. It has a traditional head shape, and we like the graphics on the face that implore you to hit from the centre. While the overall aesthetic isn't the best on the market, it’s amiable, and we wouldn't have any problems wielding this. The red shaft looks great, and adds a bit of spice to the appearance. 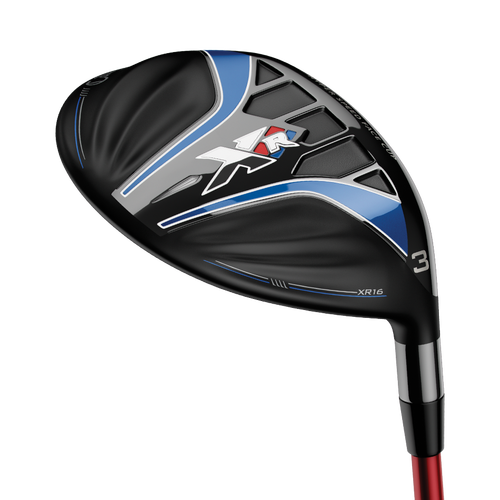 The first thing to note is the outrageous feel and sound emitted – there is no better fairway wood on the market in these regards. It has a soft but lively feel from the face, and it almost feels like you’ve hit it out the sweet spot no matter where you strike from. The sound is relatively loud, and more of a “thwack” sound, although there is a slight "Ping" sound mixed in when you really catch one. We kept re-loading and re-loading, as this is such an exceptional club to hit. The XR 16 fairway wood also marries length and distance expertly, and is one of the longest and most forgiving clubs out there. Callaway’s lightest crown ever allowed them to move discretionary weight, upping the MOI and moving CG to optimise forgiveness and distance. Furthermore, the brand added a cambered sole, meaning it works well from the deck, and the light rough. It gets through the turf with ease. The brand’s famous Hyper Speed Face Cup has been made “hotter and thinner”, raising ball speeds from all over the face. The aerodynamic head shape slices through the air with ease, giving us some of the highest club head speeds of any fairway wood, meaning more distance. It also has a relatively penetrating ball flight. In terms of workability, there are other clubs that offer more, but that is to be expected due to the forgiveness on offer. The stock Fujikura Speeder Evolution 656 shaft offers heaps of feedback, and is well balance overall. One of the best fairway woods in 2016. An absolute pleasure to hit thanks to a stunning sound and feel, while also being one of the most forgiving and longest on the market. Works well off the tee peg and the ground, thanks to the cambered sole. The Callaway XR 16 fairway employs some of Callaway’s latest and greatest technology, in what an outstanding product. Head to the Callaway website for more information.